becomes obsolete as the AI hyper-evolves.+ On-demand publishing (ODP) makes for quick updates.- The Mentifex project is considered oddball on the 'Net.+ You've got the first book about the first real AI Mind.- There are other, better, more authoritative AI textbooks.+ AI4U makes a good supplement for actually coding AI.- Artificial intelligence is too hard to understand.+ AI4U describes the AI while it is still easy to learn.- "I would rather build robots than study AI programming. "+ If you want to build a smart robot, then AI4U is for you.- "I'm only a high school student/teacher; what's the use? "+ This book will challenge even the most gifted student.- "I am not a programmer and so I can't code AI. "+ AI4U teaches you how to operate an AI, not just code it.- "I just want to do Web design, not artificial intelligence. "+ AI4U provides an AI that you may install on your website.- "I am more interested in neuroscience and/or psychology. 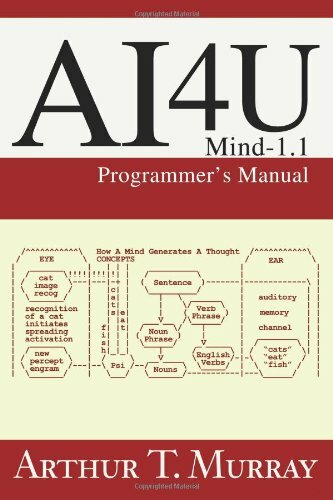 "+ AI4U teaches a theory of how the brain works psychologically.